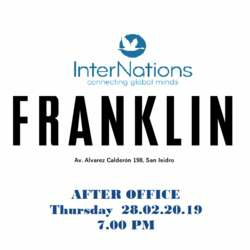 InterNations Lima After Office @ Brand-New "Franklin"
Join us for a great night in the brand new “Franklin Kitchen and Bar” located in the finest neighborhood in Lima: San Isidro, right in front of the beautiful Parque Roosevelt." Franklin is a new American cuisine and New York Deli style bistro meets Peruvian classic dishes by internationally awarded chef Coque Ossio. Design, decor, and music inspired by President Franklin D. Roosevelt's (FDR) era. Franklin has a spacious salon, an intimate lounge area, two terraces, and a luxurious bar, all designed by Arnold Rottmann. We are happy to be able to introduce to you Franklin. We have reserved exclusively all the bar and lounge area for us. And we will have some icebreaker games!!! !